The effort to control breeding grounds for mosquitoes that could carry Zika is stinging property owners with some stiff fines. Since the city launched its war on mosquitoes on August 19, it has issued $72,000 in fines against properties where stagnant water is pooling, according to figures provided to NBC 6 Investigators by the city. Small, shaded pools of stagnant water are where the mosquito that carries Zika thrives. 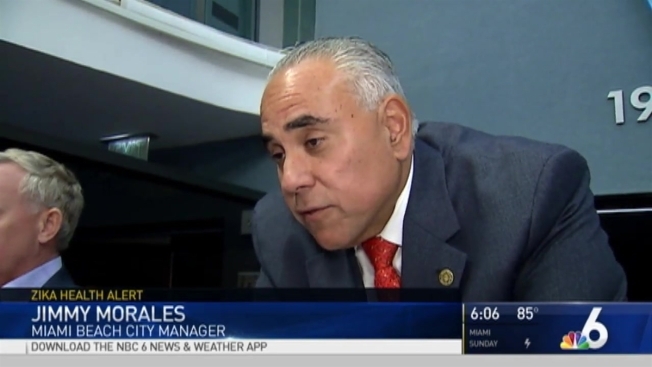 "It's really about trying to get the Zika under control," said city manager Jimmy Morales. "During this crisis period, we have gone to businesses that have such obvious violations that we do hit them with an immediate fine to try to get immediate compliance." They certainly got Paul Mata’s attention. "Thousand dollar fine? I mean a thousand dollars is a lot of money," said Mata, property manager for two dozen beach properties – one of which was cited when water dripping from air conditioning units pooled on his properly on Euclid Avenue. "If you have a puddle or something in your yard you get a thousand dollar fine?" he asked, incredulously. In all, 122 violations have been detected since August 19. Most of the 72 $1,000 fines were issued within an eighth of a mile of where three Zika-bearing mosquitoes were detected, as inspectors went door-to-door looking for potential breeding grounds. The city said it has to issue the $1,000 fines – what are called "forthwith" fines – because only they allow the city to immediately enter properties and correct the problems, if the owners do not do so. Behind the Guess store at 736 Collins Avenue, the fix was made: a bed of stones filled in the area where air conditioner condensate was accumulating during an inspection that produced one of the $1,000 fines. But the water still flowed into the alley gutter, which is city property, and accumulated there. Within minutes of NBC 6 Investigators spotting the pooling water, a city public works vacuum truck and crew showed up and swept the water away. Mata and others say they will appeal the fines – and they may, in fact, prevail, if they show they took immediate action to cure the problems. The city said it is doing its part and the fines should encourage owners to do theirs. As for Mata, he said: message received. "I did send out maintenance crews to every one of the buildings to check for any sort of standing water, so it did get my attention," he said. The air conditioners’ drains on his Euclid Avenue property are now connected to tubing that drains into downspouts.